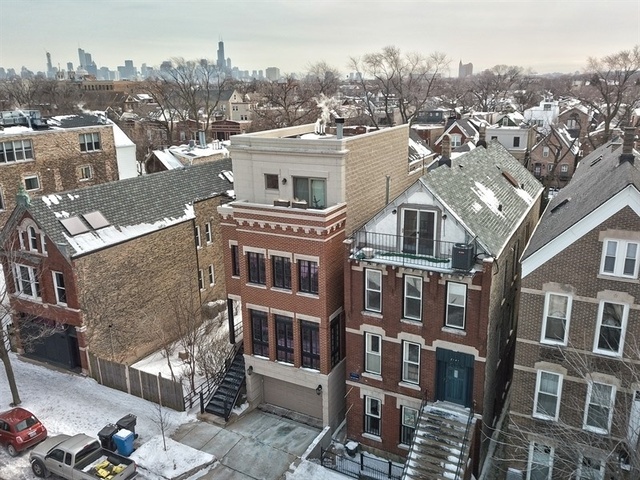 Luxurious 4-Story Pappageorge Bucktown SFH w/ Premium Finishings. Four Outdoor Areas (3 Decks/1 Patio). Quartz Countertops, Medallion Custom Cabinetry/Built-ins, and Kohler Hardware throughout. Whole-House (Interior/Exterior) Sound System w/BlueTooth Receiver. ADT Security System. Spacious Chef's Style Kitchen open to Family Room/Deck. Large Dining and Formal Living Room w/WB fireplace and elevated Floor-to-Ceiling Windows. Master Suite on 2nd Floor with Juliet Balcony, 2 WIC and Spa-like Bath w/Jacuzzi Tub, Steam Shower & Double Sinks. Additional 2nd Floor Bedroom with full bath and WIC. Lower floor includes Walk-out Patio, Third Bedroom, Full Bath and Heated 2-Car Garage with Electric Vehicle Charger (EV 240V). 4th Floor Penthouse is currently being used as a Media Room but can easily be converted. Includes Full Bath, Wet-Bar, Built-in Surround Sound and Two Decks with North/South Views. Large Southern Roof-Top Deck is perfect for entertaining. Great Location! Easy Highway Access!